Things have changed in the 3a pillar realm since the publication of this blogpost. So make sure to read my article about the new best third pillar for Swiss Mustachians. Last year, I ran a challenge to find the cheapest bank that sell the best third pillar for Swiss investors. Thanks to your help, I found my Graal: a third pillar deductible from taxes, but that could additionally be invested in stocks and bonds. 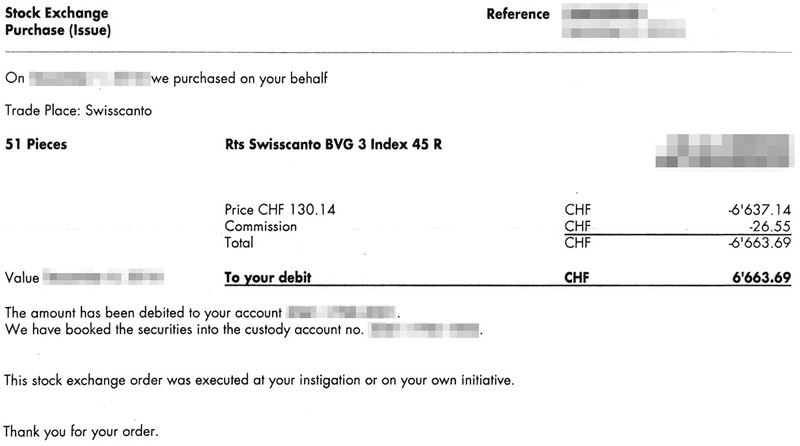 As most of you already know, my pension index fund of choice is the Swisscanto LLP 3 Index 45 R.
It allows you to invest up to 45% of your CHF 6'768 1 in index funds with the lowest fees out there (0.25% of custody fees, and 0.40% of transaction fees). Other banking institutions offer you products that supposedly have better performance, but the only thing you can be sure of are the higher fees of their fund's active management. Together with some of the readers, we meticulously scanned no fewer than twenty-five Swiss banks that propose the Swisscanto products, and found that the one that offers the lowest fees for this pension fund is the Luzerner Kantonalbank (aka LUKB). As I wanted to open my account at LUKB, I thought it would be easier to send them an email in English rather than to ask for an English person in German! That's when I faced an issue: the lady replied that it was not possible to do it without me visiting them in Luzern. I was disappointed because I couldn't get there before a few months, which was too late for my taxes deduction. Thankfully, I persevered and contacted the call center with my best accent: "Sprechen Sie Englisch?". I ended up speaking to a very nice guy who wanted to help me. The main trick was (like with most life situations) to call and discuss with a human to find a solution. This may sound obvious to most of the readers but it is still interesting to know how the accounts are setup when you invest your third pillar money into a fund. Once you open the relationship with LUKB, you get a "standard" third pillar account where you can throw your yearly CHF 6'768 payment. On top of that, you need to open a custody account to store the index funds you acquire with the cash on your first account — like when you trade shares with Interactive Brokers. Again, it may sound crystal clear to most of you, but on my side, I thought I would get only one "packaged account" that'd hide the complexity to customers. What I like a lot with their system is that in case Swisscanto releases a "LLP 3 Index 75 R" with up to 75% of the cash invested in shares (as PostFinance did recently), then I could switch to it with my next year transaction! Without much surprise, the transaction costs were identicals with the ones we gathered: 0.40%. As I write this blogpost, I searched for the custody fees statement and realized that I didn't receive any such document. But I don't worry and am sure that the LUKB won't forget to reclaim their 0.25% of custody fees! Did you end up opening a LUKB third pillar account? Or did you choose another alternative? ← 7 life lessons from "Minimalism: A Documentary About the Important Things"